Living a Fit and Full Life: Fall in Love with Swaddle Designs Muslin Swaddle Blanket's Touch of Shimmer Collection! + Giveaway! Fall in Love with Swaddle Designs Muslin Swaddle Blanket's Touch of Shimmer Collection! + Giveaway! SwaddleDesigns continues to grow, innovate and invest. The SwaddleDesigns line includes many layette essentials including the zzZipMe Sack™ wearable blanket, stroller blankets, bibs, hooded towels, washcloths, a luxurious home collection with adult size blankets and throws, and a luscious certified organic cotton collection. The vast majority of our products are sewn in Seattle, Washington. We procure components directly from leading suppliers to ensure the quality of our products. SwaddleDesigns consistently delivers high quality, and we enjoy many benefits because of our Made in USA strategy. 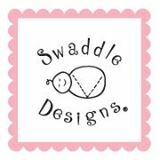 SwaddleDesigns is proud to be creating American jobs and exporting our products to Europe, Asia, Australia, and the Americas. 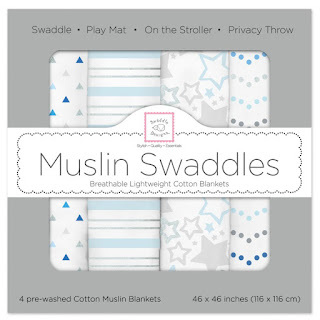 Swaddle Designs Muslin Swaddle Blanket's Touch of Shimmer Collection is incredibly beautiful! Not only are they incredibly beautiful but they're the easiest swaddling blankets to use because the swaddling instructions are sewn to the edge. I remember 9 years ago when I had my oldest trying to figure out how to swaddle her. The nurses at the hospital made it look extremely easy but when I got home I couldn't figure it out for the life of me. Now that I've had 4 kids I finally managed to figure it out with my last and boy do I wish I had figured it out with my first because my son absolutely loved being swaddled. He slept much better and overall seemed to be a much happier baby when swaddled. 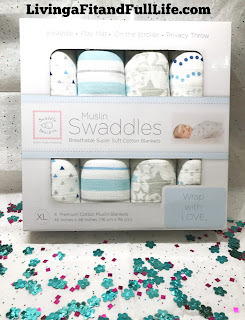 Swaddle Designs Muslin Swaddle Blanket's Touch of Shimmer Collection would make a terrific baby shower gift and as a mom of 4 I can tell you the recipient will be more than thrilled with these blankets. They can be used to swaddle baby, cover strollers and car seats, as a nursing cover or for tummy time. I love their extra large size and oh so soft texture. Swaddle Designs Muslin Swaddle Blanket's Touch of Shimmer Collection comes in pink, blue and gender neutral so there's sure to be a set that's just right for you!